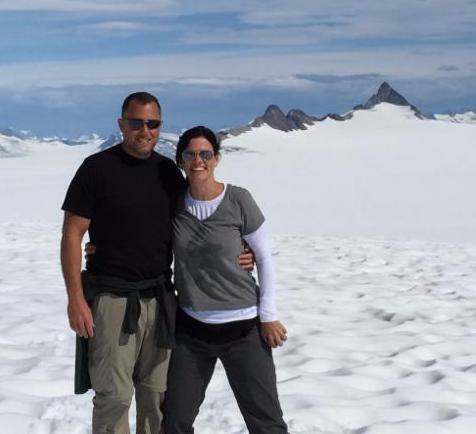 Vince and De enjoying the beautiful scenery on a trip to Alaska in 2015. We really can’t recall meeting De or Vince for the first time. Unassuming, quiet, and calm, they are not ones to cause a scene or make their presence known. However, meet them and you feel like you’ve reconnected with your dearest childhood friends. Members at PrimeTime since June 2012, it’s almost as if they’ve been around for much longer because of the comfortable, gentle, friendly nature that both of them possess. Neither are strangers in a gym, especially Vince. Being an ex-athlete and having trained competitively for so long, Vince gravitates towards weight-lifting as his favorite form of exercise. He has no trouble motivating himself to go to the gym and is a self-proclaimed gym- rat! De, on the other hand, prefers outdoor activities – she loves swimming and biking – and her favorite way to get her sweat on indoors is hip-hop dancing, but Vince is often able to encourage her to join him for a gym workout. challenging themselves to step outside their comfort zones and try new classes and workout routines helps them avoid getting into a rut. And what goes better with a great physical routine than clean eating habits . . . they have also put an emphasis on changing their dietary regimen as well. Coming from Pittsburgh eight years ago, De and Vince left behind a climate and lifestyle that is not conducive to being physically fit. Although neither of them were in poor condition when they moved to Charleston, their fitness has improved every year since they’ve been here, and they credit some of that to PrimeTime. Vince has a personal goal on his birthday each year to honestly be able to say that he is in better shape than he was the previous year. So far he hasn’t lied! Fitting in exercise around professional responsibilities is a priority for both De and Vince. De traveled to Sydney, AU for an adventure after graduating from Indiana University of PA, and liked it so much she decided to stay there and live. If they hadn’t kicked her out on account of her work Visa she would probably still be there! Vince is a member of a secret society at Yale University – you can ask him about it but he won’t tell you. Well said, guys! Keep spreading the word and walking the talk. We love having you both with us at PrimeTime!